The dead give-away of folks protesting rather too loudly has been employed since last Sunday by Nigel “Thirsty” Farage and his fellow saloon bar propper-uppers at UKIP following an incident at the pub where Mr Thirsty, and allegedly his family, were enjoying their lunch. A “beyond UKIP cabaret” had conga-ed across from an adjacent pub. Farage left in short order and then declared that the group were “scum”. "Gay marriage" ... "Global warming" ... "Eco-crucifixes" ... "Red-meat Conservatism" ... "Evidence-free ranting" ... "Increasing irrelevance"
Moreover, cabaret organiser Dan Glass was then treated to the full sneering and patronising treatment on the BBC’s Daily Politics by Patrick “Lunchtime” O’Flynn, who has inexplicably become an MEP. Glass and his “stunt” were the bad guys, and they had allegedly frightened Farage’s children, causing them to run off. This was the clincher, and caused many neutrals to side with the UKIP leader. However, and here we encounter a significantly sized however, all was not, it seems, as was painted by Farage and his spinners. The “beyond UKIP cabaret” had not forced anyone out of the pub - Mr Thirsty claimed they had - and a photographer who witnessed the scene told “As some protesters and the press entered the rear of the pub, I saw a blonde-haired woman leaving with two children....the scene was calm although she seemed very keen to get out of the pub, possibly not wanting them to be identified”. All of which sounds like the rest of Farage's family left before he did, which would explain his wife being at the wheel of their car as he made his exit. So Mr Thirsty’s tale was trowelled on somewhat: the only complaint he had was that many of the protestors surrounded his car as his wife attempted to drive away. That was out of order. 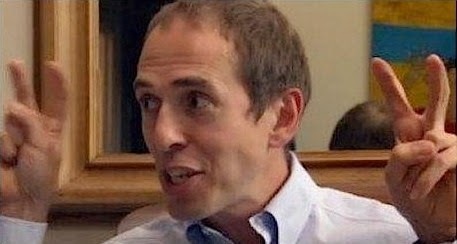 None of this was allowed to enter as Farage fan James “saviour of Western civilisation” Delingpole fired up his air quotes and auto-sneer combo, telling “As Farage has been reminded, there’s no fascist like a liberal fascist”, and talking of “the protestors who had Farage’s children fleeing in fear”. Sadly, actual facts are thin on the ground here, as Del Boy chooses instead to declare the protestors guilty by Guardian connection. And Del’s targeting of Guardian columnist Suzanne Moore is not an accident, either: the King of the Air Quotes is clearly still smarting from when the Telegraph’s then editor Tony Gallagher bawled him out over a viciously misogynistic Twitter excursion over two years ago for which he was prevailed upon not only to apologise, but write what Ms Moore later described as “a heartfelt letter of apology”. Farage may have been chased from the pub. More likely he wasn’t, but decided to play the victim and dump on Dan Glass and his fellow protestors for being “different” to what he has decided is acceptable. Either way, Del Boy hasn’t bothered to research what actually happened, because the red mist has descended at the sight of Suzanne Moore being allowed to have her own opinion, and so auto-rant mode has been engaged. That says more about Delingpole’s prejudices than it does about reality. As usual. As ever, Tim, you fight the good fight. But sadly those self-indulgent idiots have handed UKIP a huge propaganda gift, and naturally Nige and his pals will be making the most of it.